I'm sure you already are aware, but Puff and I like to travel. We don't do the same travel these days as we used to... gone are the years we jet off to Louisiana for a prison rodeo just a few months after getting back from Russia. However, since Bimmer has come along, we've tried to keep up the best we can. (She has already been to 8 states!) Even in the short time she's been traveling with us, we've already switched up our game plan. The older she gets, the less stuff she needs, and the easier it is to just hop in the car and go! Bimmer's first road trip was when she was only 5 1/2 weeks old. We kinda maybe sorta took a whole bunch o' crap. Even though we took less than other people... there was no bathtub or swing or second stroller. Now? Well, as she is approaching two, traveling light(er) is much easier. How do we pack? Well, here ya go. Now, keep in mind, this is for road trips only. We'll be sure to fill you in this coming summer when we brave an airplane for the first time! 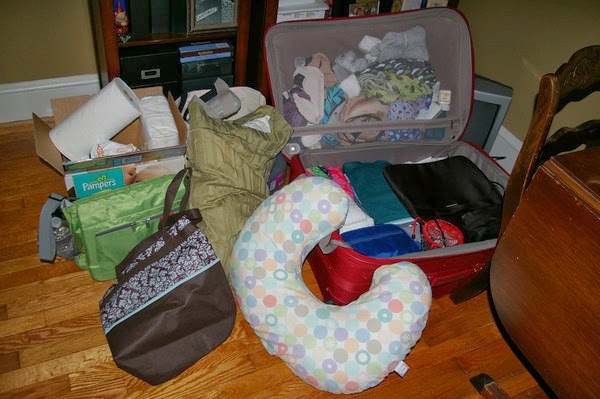 #1 - The Family Suitcase - We take one suitcase, even if it's the biggest one we own (if we're going to be gone awhile), and that's where we stash all Bimmer's clothes, pajamas, socks, shoes, accessories, etc. Right in there with mine and Puff's. #2 - The Large Tote - Bimmer still comes with additional paraphernalia these days, so we carry one large tote bag with diapers, wipes, sippy cups/bottles, medicines, etc. Especially on road trips, this is a super easy bag to get into and grab something if you need it fast! 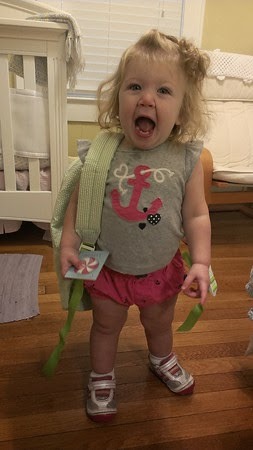 #3 - The Back Pack - If we are going to be gone more than a weekend, we have started to take a toddler backpack where we can stash a few books, some toys, and her snacks. Otherwise, these will just got in the tote bag. #4 - That Other Crap - We still tote around an umbrella stroller for Bimmer (even though on our latest trip to The Fort, we didn't even use it once!) and a diaper bag. Although I've realized the past few months that we don't even carry the bag into places anymore, so I'm about to nix it all together in favor of a few diapers and wipes in each car. Yay for one less thing to worry about packing! So, I know it's probably not all that different of a list than anyone else's, but it's OUR list that works for US. Lots of people separate kids clothes into their own suitcase, carry boxes of diapers, etc. We are happy to go away with one suitcase, one tote bag, and one stroller. That's it. We don't need anything else. And how do we keep her entertained in the car? Well, we have decided she has about an 8 hour max, which is my max as well, so it works out. We are lucky that she must just have some travel in her genes, because a lot of the time, she's content to look out the window and check it all out. We're inclined to encourage that as long as possible. Sometimes we slip her a baby doll or a book. We sing songs with her and sometimes act a little goofy. But we DO NOT pull out a DVD player, iPad, etc. And we will continue to avoid that as long as humanly possible. Puff and I didn't have that luxury when we were growing up, and we don't want to encourage it with Bimmer. Puff and I both felt like we had good family bonding time and learned a lot about geography, history, our country, etc. when we were "forced" to be without electronics in the car.